Since 1970, the Clean Air Act has helped Americans breathe easier and live healthier lives. The Environmental Protection Agency has also made the reduction of Hazardous Air Pollutants a top priority over the last few decades. It’s important that if you are working with these pollutants, you follow the rules of compliance for working safely. Chesapeake Automotive Equipment invites you to take a few moments to reevaluate the standards you have in place when spraying paint and other pollutants. If you are looking to buy a booth, we recommend that you speak with your local officials first to find out what is required. It’s better to get things set up correctly from the start, rather than having to pay fines and extra set-up costs later. Your fire marshal can give you the city’s requirements, but you should also contact your local EPA office to see if you will be required to meet additional requirements as well. It’s a good idea to have all your permits in place before you buy your booth. Have you read the labels and made yourself familiar with what all those ingredients are? Do you have the proper protective gear and equipment for you and your staff to protect their health and safety? Take time to understand these products and research the safety hazards they may create if improperly cared for or sprayed, and be sure that your staff is trained on the products as well. Spray booths used to coat miscellaneous parts or products or vehicle sub-assemblies must have a full roof and at least three complete walls or side curtains, and must be ventilated so that air is drawn into the booth. 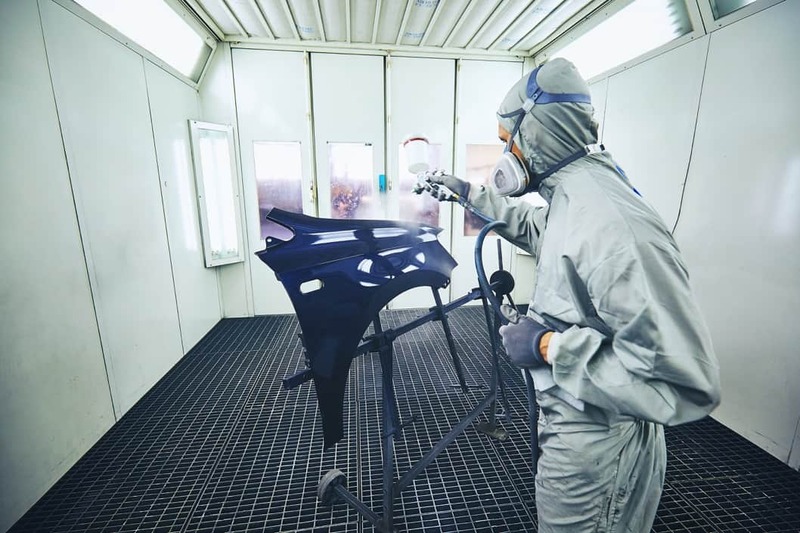 Spray-applied coatings must be applied with a high-volume, low-pressure (HVLP) spray gun, electrostatic application, airless or air-assisted airless spray gun, or an equivalent technology. Install/operate filter technologies on all spray booths to achieve at least 98 percent capture efficiency.